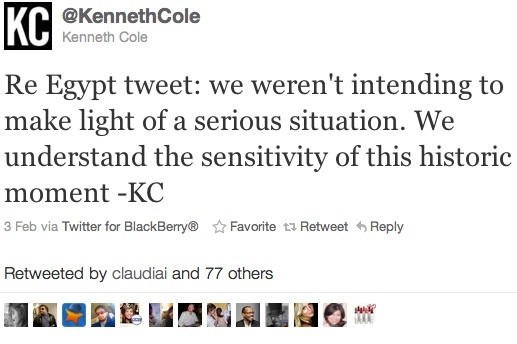 By now I imagine you have heard of the insensitive tweet Kenneth Cole himself graced us with yesterday. This “attempt at humor” as Cole later classified it, certainly got the twittersphere and blogosphere’s attention. After reading and commenting on this blog post by Heather Whaling concerning 2 PR lessons learned from the gaffe, I decided to cover what I believe are the salient lessons in PR/Crisis Communications and even social media best practices that can be gleaned from this strange attempt to piggy-back off of the events occurring in the Middle East. 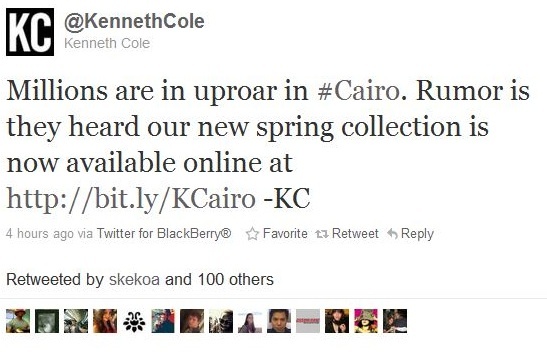 First, I would offer that Kenneth Cole’s gaffe is a pretty big deal; mainly because of the context in which it was made. No matter your political leanings or how you look at the unrest in Egypt and the Middle East, the fact is people are dying (and therefore not the wisest source of comedic material.) With regard to long-term effects of his original tweet (pictured above), I’ve heard the phrase boy-cott mentioned a few times already, but I would offer that the damage will more likely come from Cole’s resources now being differed from ‘business as usual’ to damage control and especially from his weak apology offered on two social channels (Twitter & Facebook). The larger lesson (and Crisis Communications 101) to be learned from this situation in my opinion has to do with this so-called apology, “We weren’t intending to…” First, sincerity is key and it doesn’t seem sincere. Cole’s tweet doesn’t come across as someone who understands the offenses’ impact and there is no mention of any corrective action (I do understand this may be difficult to communicate in 140 characters but his Facebook message doesn’t offer it either.) Second, I would argue the second tweet wasn’t voluntary. It wasn’t until after the S**# storm started that he tweeted it. Taken together, this presents a major flaw in the apology and hints that this won’t be forgiven/forgotten anytime soon. To couch this in social media, and with regard to Cole’s responses, I do appreciate his posting of an apology on Facebook on his discussion board, and obviously responding on Twitter (where the gaffe originated) was appropriate. But the best lesson in terms of social media and best practices comes from blogger Mack Collier when he wrote in his post yesterday that brands shouldn’t attempt to leverage conversations happening in social media that they haven’t participated in. This goes back to listening first and then participating only where you or your brand can provide some value – End of story. Adam thanks for the mention. As big as this episode was, it could have been much worse if KC hadn’t responded within a few hours by deleting the tweet then later apologizing on Twitter. Remember that with Motrin Moms, it became a big deal over the weekend when Motrin never addressed the situation to anyone on Twitter or blogging. If KC had ignored this for a couple of days like Motrin did, the outrage would have been much more severe. Hopefully, KC will use this as a lesson on why he and his company need to improve how they use new media tools and sites. Have a great weekend!